One of the most significant adaptive mobility technologies developed in the last decades of the twentieth century that enabled persons with severe disabilities such as high-level quadriplegics to drive was the adaptation of fly by wire to drive by wire. Airplanes originally were piloted by complex mechanical linkages from the flight controls to the ailerons, flaps, and rudder. In the 1970s, NASA developed fly by wire technology to maneuver the Apollo Lunar Module. Fly by wire technology translates a pilot's operations into electronic signals that computers use to manipulate the control surfaces on the wings and tail with vacuum assists or servomotors. Fly by wire also increases safety by monitoring the pilot's inputs and preventing errors that would exceed the aircraft's flight envelope. This technology was first used in fighter planes and is now employed in most modern jet aircraft. Scott Bolduc was in his twenties and managing an auto repair shop when his friend Dale Crafts was injured in a motorcycle accident. After recovering and going through rehabilitation, Crafts reclaimed his independence and began driving a wheelchair accessible van. Unfortunately, he often had mechanical difficulties, and none of the local shops could perform the repairs. Bolduc asked his employer John Crafts, Dale’s father, if the shop in John Craft Auto Sales could start repairing vehicles modified for disabled drivers. 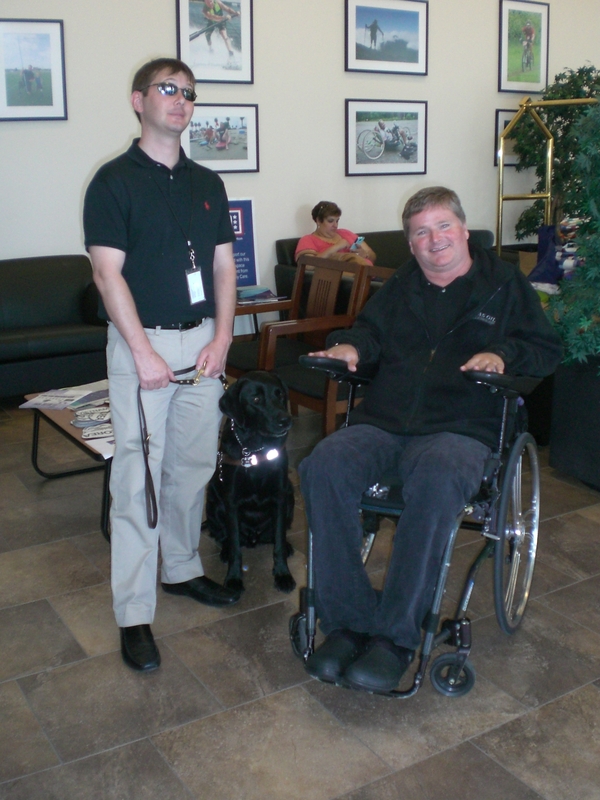 This was how Bolduc got his start in adaptive mobility equipment. 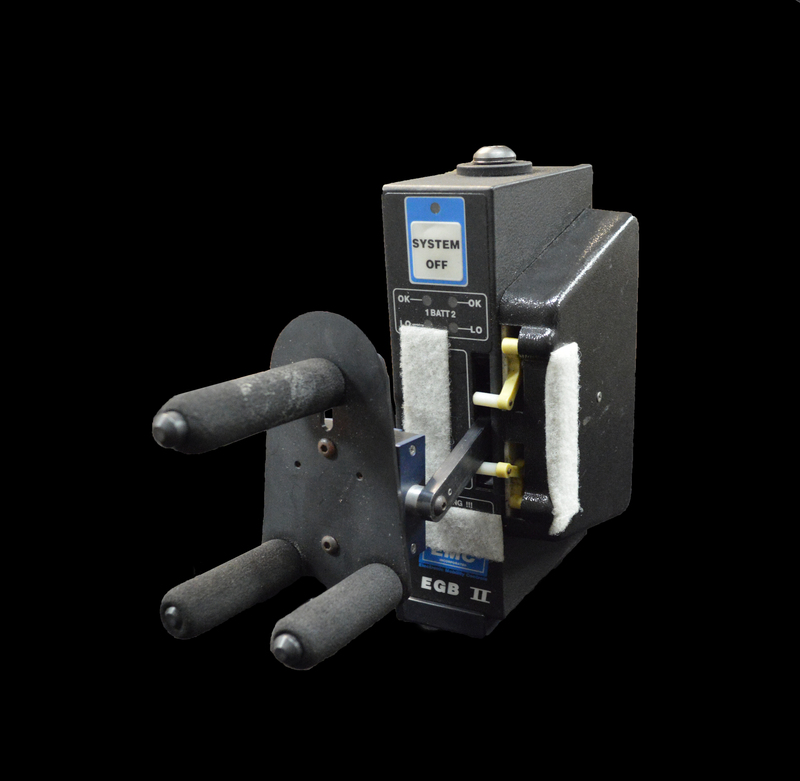 Over the years, Bolduc began tinkering with electronic driving controls and became a pioneer of drive by wire systems. 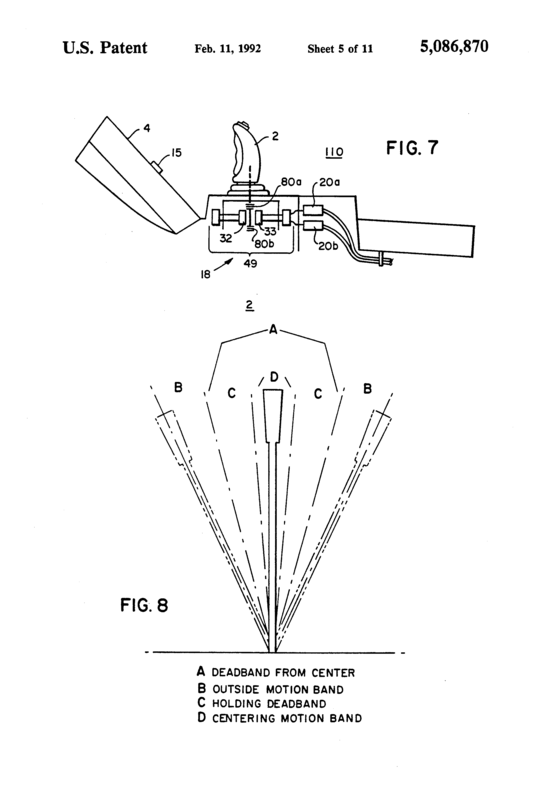 Bolduc's inspiration for drive by wire technology was his experience flying military aircraft. Pilots under heavy G forces experience limited mobility, and fly by wire controls enable them to pilot high performance aircraft. Mechanical linkages require more strength to manipulate the control surfaces and cannot be used in conditions of supersonic speeds and heavy G forces. Bolduc compared his experiences of heavy G forces to the limited mobility of persons like quadriplegics, and set out to adapt fly by wire technology into electronic mobility equipment for disabled drivers. He envisioned an electronic user interface that integrated gas, brakes, steering, and secondary controls that could be operated by a person with severe mobility limitations. 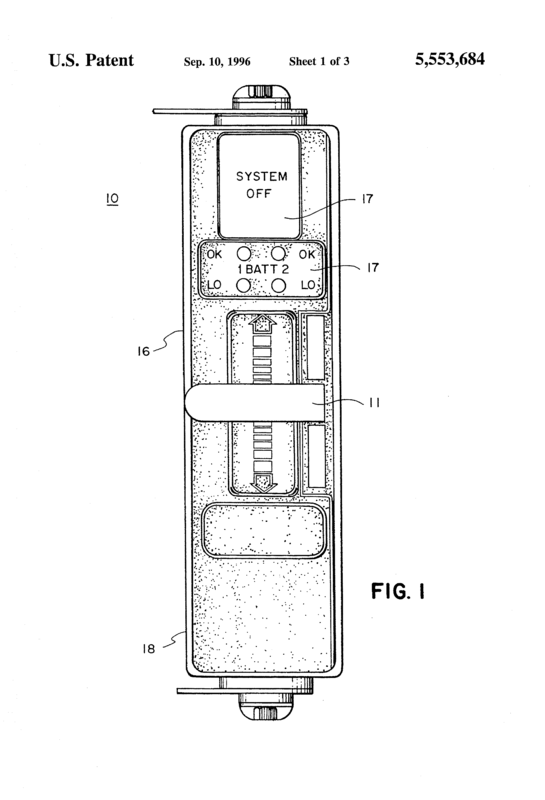 Three patent drawings from Scott Bolduc's patent applications for drive-by-wire controls. Click here the full patent applications from Google. Bolduc assembled an engineering team that started with electronic fly by wire systems from advanced aerospace projects and developed a system of improved fault tolerant controllers communicating through a CANbus controller area network, and powerful redundant electric servomotors. This system was accessible to average operators with small budgets and no longer restricted them to seating and control positioning available in production automobiles. A six-year research and development endeavor resulted in the first totally drive by wire automobile which hit the road in 1986. 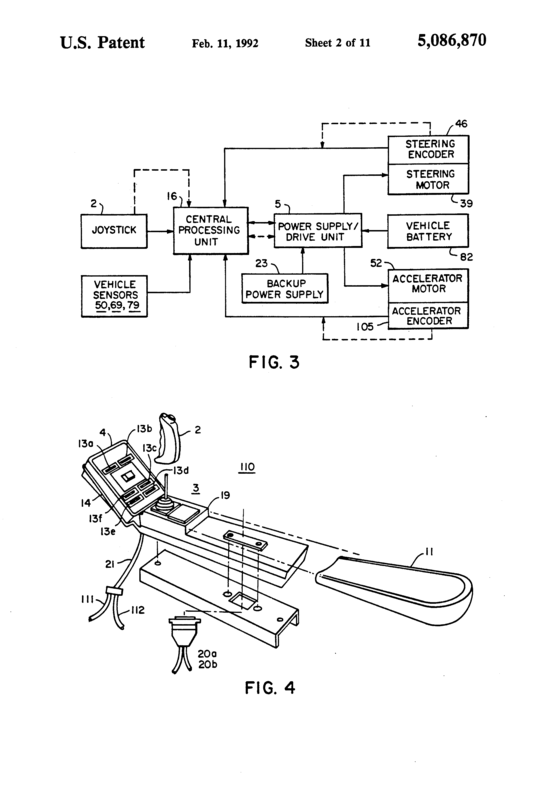 Bolduc and his team continued the endeavor , and in 1990 Digidrive became the first patented commercially available drive by wire automobile system. Digidrive integrated gas, brake, and steering into a single joystick controller that operated electric servomotors. These motors in turn manipulated the manufacturer’s original equipment. Bolduc is now the founder and CEO of Electronic Mobility Controls, a world leader in drive by wire systems. The company designs and manufactures all of its products. Their latest is known as the Advanced Electronic Vehicle Interface Technology or AEVIT. 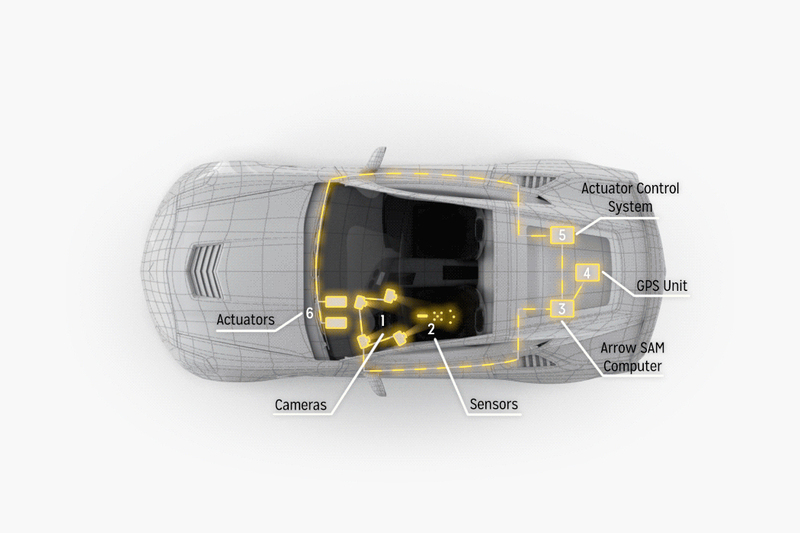 The system functions by translating the driver’s manipulation of a driving control such as a lever, yoke, joystick, or wheel into an electrical signal that a central processor uses to control electromechanical servomotors that actuate the vehicle’s gas, brake, and steering. Sprockets are installed on the accelerator pedal, brake pedal, and steering column that are driven by a sprocket on the servomotor to manipulate the original manufacturer’s equipment. Federal Motor Vehicle Safety Standards prohibit alteration of the automobile’s original equipment made by the manufacturer. Electronic Mobility Controls provides several options for systems that operate secondary controls such as ignition, parking brake, blinkers, horn, lights, windshield wipers, HVAC, or other features. Depending on the driver’s needs, the vehicle can be outfitted with a touchscreen or a voice activated system. One particularly innovative secondary control offered by Electronic Mobility Controls is called Digitone. Using a button placed where it is most convenient for a particular driver, such as on the gas brake lever, a steering wheel spinner knob, the headrest, or on an elbow switch mounted on the center console, the driver initiate a sequences of eight tones of a musical octave, with each tone being assigned to a secondary function. When the driver hears the tone corresponding to the function they wish to activate, they press the button a second time to perform the desired function. This system is particularly useful for individuals who must keep both hands on the primary functions or lack the mobility to use a touchscreen. It allows them to use auditory skills rather than physical movements. The primary and secondary electronic control systems of AEVIT are required by persons with severe mobility impairments and high-level quadriplegics driving from wheelchairs in accessible vans. Dr. Scott Falci is a neurosurgeon who has devoted his life to developing procedures and treatments for spinal cord injuries. In addition to his medical endeavors, Dr. Falci started a non- profit organization that provides recreational therapy through adaptive motor sports. Falci Adaptive Motor Sports (FAM) was founded in March 2012 with the mission of putting paralyzed racing enthusiasts on the track. FAM's cars serve as developmental platforms to push the limits and advance adaptive mobility technology. The organization was inspired by one of Dr. Falci's patients, former race car driver and paraplegic Mike Bauer. FAM set out to design a high performance car from the ground up with a paraplegic driver in mind. A 2001 Corvette C5 Stingray was outfitted with an accelerator ring on the steering wheel for throttle and a separate hand controlled brake. The accelerator ring is mounted just underneath the steering wheel, and squeezing it inward toward the wheel increases acceleration by directly manipulating the throttle body. This arrangement allows both hands to be on the wheel if needed and simultaneous application of throttle and brakes. In order to preserve an authentic racing experience, the design team chose a manual transmission and installed an automatic servo clutch. An infrared sensor on the gearshift knob activated a servomotor that disengaged the clutch when the driver grasps it; after shifting, the clutch is reengaged when the driver releases the knob. The project was a success, and the car became known as the Paravette. After success with the Paravette, Dr. Falci wanted to develop a Corvette that could be driven by a high level quadriplegic. 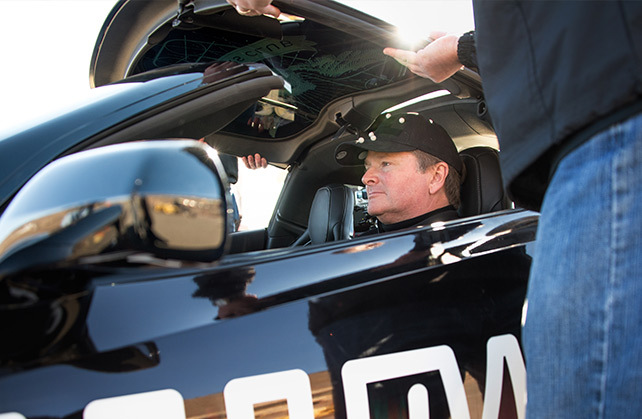 One of Falci’s patients introduced him to former Indy car racer Sam Schmidt, who had crashed his car during off-season preparation at Walt Disney World Speedway in 2000, suffering a spinal cord injury that rendered him paralyzed from the shoulders down. Falci Adaptive Motor Sports and Schmidt's racing team, Schmidt Peterson Motor Sports, collaborated with four Colorado-based organizations -- Arrow Electronics, Ball Aerospace and Technologies, Craig Rehabilitation Hospital, and the Air Force Research Laboratory -- to create the first car that could be operated by a driver using only the eyes, head, and mouth. One question drove the project: "What if you turned the driver's head into a joystick?" Ball had been developing head motion piloting systems for the military. A team of Arrow and Ball engineers developed an innovative driving system that combined infrared cameras, computer signal processing, and flight simulator technology. Cameras that detect visible light sense color, shadows, and detail, but this data is too noisy to control a vehicle. The solution was to design a system of infrared cameras that read reflectors on a racing cap and tracked head motions in real time. This data was used to steer and throttle. Tilting the head back toward the headrest controlled acceleration while tilting left or right controlled turning. Initial testing encountered difficulties because the sun's low position in the horizon at sunrise and sunset interfered with the cameras. Tinting the windows regulated light levels so that the system could perform at any time of day. A pressure sensor was developed to control braking by means of a plastic mouthpiece. Biting down engaged the brakes, with increased pressure applying harder braking. Schmidt and the team of engineers spent hundreds of hours over the course of ten months testing and refining the controls using a driving simulator. 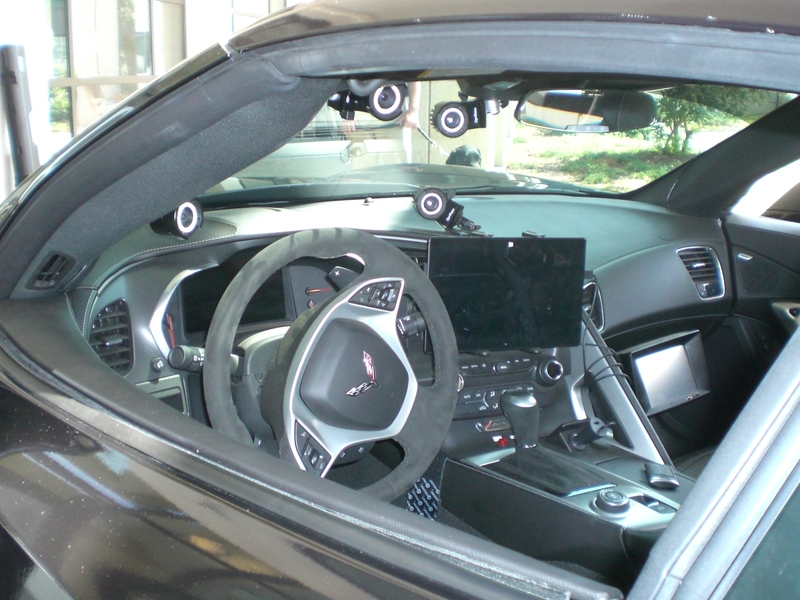 After the team was confident with simulated results, they began outfitting a 2014 Corvette C7 Stingray. 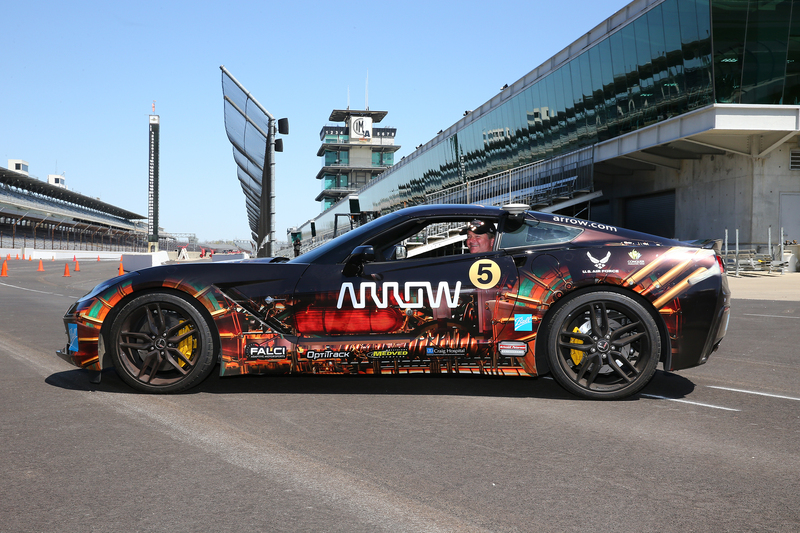 The major engineering challenge was developing algorithms and a central processor to convert the head motion data into a signal that could be processed by Scott Bolduc's drive by wire Advanced Electronic Vehicle Interface Technology. Their efforts paid off and the algorithms worked. Through the drive by wire system head motions input into the Advanced Electronic Vehicle Interface Technology and servomotors actuate the steering along with the gas and brake pedals. GPS, a set of override controls, and barriers to block the pedals were installed as safety measures. An advanced GPS system that updates its position 100 times a second created virtual boundaries and provided warnings if the car begins to veer off the plotted course. Override controls on the passenger side allow an able-bodied safety engineer to take over if necessary. Once the Corvette was outfitted, it was time to put Schmidt in the driver's seat. Dr. Falci used his expertise to devise the best way to position Schmidt in the seat. Due to his lack of torso control and the risk of skin sores, a customized seat provided adequate torso support, head support, and padding. A specialized harness kept him stabilized. Once Schmidt was securely in the driver's seat, test drives at the Air Force Laboratory, along with more hours in the simulator, prepared him once again for the racetrack. Since the invention of the automobile, persons with disabilities and those close to them have been modifying their vehicles to accommodate their particular needs. In the first half of the twentieth century, tinkerers and inventors developed the first generation of mobility equipment for disabled drivers and laid the foundation for the high-tech industry that we have today. Entrepreneurs and small business owners have been the driving force behind this industry, which has continually provided new innovations that have empowered more and more people with higher level disabilities to drive. Driving one’s own automobile is a very empowering experience, and when the freedom and opportunity auto mobility provides is considered, we can understand America’s love affair with automobiles. There is an undeniable feeling of allure and empowerment associated with getting in the driver’s seat, pointing your life in a direction, and controlling how fast you get to your destination.